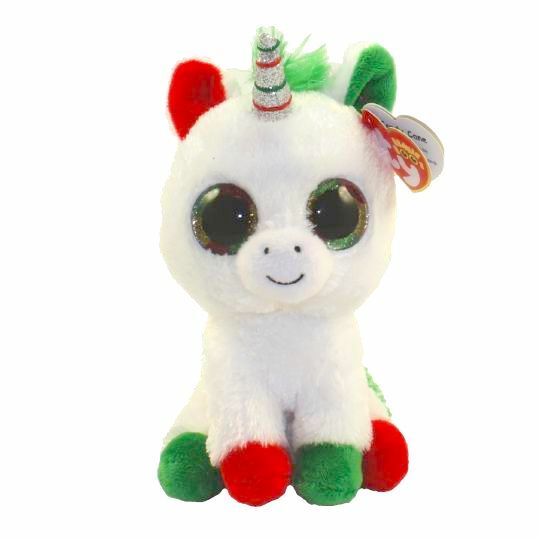 Candy Cane is a white Christmas-themed unicorn with large, glittery button eyes in a mixture of green, gold and red. She has one red ear and one green ear and her hooves are also green and red. She has a green fluffy mane and a green fluffy tail. On top of her head is a silver sparkly horn. That I’ll be able to lead the sleigh. Candy Cane was released in June 2018. Her Birthday is on 29th December. There are three versions of Candy Cane: This medium sized 9″ Beanie Boo Buddy, a small 6″ Beanie Boo and a key clip.